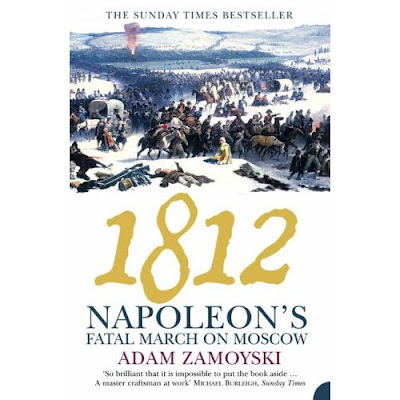 I finally finished reading 1812: Napoleon's Fatal March on Moscow by Adam Zamoyski. It was a great read. It really got me keen to get some of this campaign onto the tabletop ahead of time. I did want to fully exhaust Waterloo and 100 Days prior to moving to another year but this volume got me there prematurely. I also have a similar work by Natziger and will probably launch into that one next. I was very excited to see all the detail about the lead up to and the reasons for Napoleon invading Russia. While I don't agree he did the right thing, I do agree something had to be done to reign in Alexander and the Russian rise of nationalism. Although I think the whole episode actually sped this along. Napoleon should definitely have won this. More aggressiveness in the beginning and more support whilst on campaign would have had it overwith by the winter. Both sides underestimated the winter although the French moreso. It was by my understanding the winter that beat the French. And the Russians skillfull use of it. One thing I learned was that the Russians lost just as many as the French did to the weather and lack of food. Very interesting. One thing I did not like about this book was the extensive repetition of death from starvation and cold. Certainly some great excerpts from memoirs are used, but it seems to get whole sections on it on a number of different occassions and I found myself reading the 1st line of each paragraph moving through the accounts of who died of what until I found a new paragraph that continued the story. The contacts were rarely detailed and when they did, it was good to follow with a historical map and Order of Battle. I am now keen to see more detail in the actual combats that took place. For anyone open to a full account of the campaign before moving to an area of research, this book is a good read and addition to your library.